It is a truth universally acknowledged that an ecommerce marketer in possession of a high cart abandonment rate must be in want of a kickass campaign. But what does a kickass cart abandonment campaign actually look like today? After all, almost half a decade has passed since we first started talking about this ecommerce marketing hack, and what was considered cutting-edge back then will likely be old-hat by now. In case there’s any lingering doubt on the issue, let’s start by clarifying why ecommerce marketers should be using cart abandonment campaigns in the first place. As previously discussed, the average online shopping cart abandonment rate is surprisingly high at almost 70 per cent. The next question, then, is what proportion of that 70 per cent could be saved by follow up marketing messages from a brand, reminding them of what they’ve left behind? Being insight experts we turned to our own data to find out, and from those results we predict that—on average—abandoned basket campaigns account for roughly two per cent of a retailer’s monthly revenue. When you bear in mind that that “two per cent” only takes into consideration direct attribution, such as click-through conversions and coupon codes, it becomes clear that this is an automated campaign you want to get right (however, as always, there's a chance they would have converted anyway—more on this later). Cart abandonment emails display items an online consumer has left in their shopping cart, and are therefore by their very nature personalised. However, there are a few ways you can ensure your triggered emails are even more bespoke, starting with segmentation. To recap: segmentation is the process of dividing your subscriber and/or customer base into groups according to certain shared attributes, examples of which are listed below. Once you have your segments ready you can target them in different ways, taking into consideration key factors such as: frequency, content and discount. 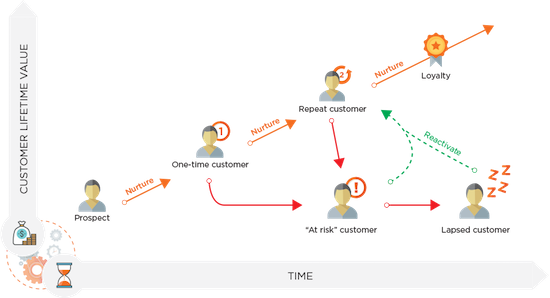 The basic stages of the customer lifecycle can be defined as: lead, active, at-risk, lapsed (for more information, check out or topic guide here). Each of these groups of people require a different approach, so segmenting your cart abandonment emails for each is beneficial. For example, you might choose to send a lapsed customer who you want to “win back” a greater number of emails and a discount code, whereas active customers might only require a single email. As always, A/B testing is the best way of ascertaining the best formula for each. Tying in with lifecycle stage, you may want to adapt your cart abandonment strategy depending on the amount a customer has spent with you (their lifetime value). For instance, since your ‘VIP’ top spenders are likely to be active and regularly shopping, you may want to send them fewer (or indeed no) cart abandonment emails, as they’re likely to come back and purchase anyway and you don’t want to risk annoying them. Another factor to segment your cart abandonment emails on is the value of the basket’s value. For example, if an abandoned basket is worth over a certain amount (let’s say £200), you may want to add that recipient to a specific list and offer them a higher level of treatment and support, or maybe a discount to make sure they convert. For *really* high-end luxury brands, this could take the form of a personal phone call. However, for other brands it could just mean you’re willing to invest more money into social retargeting for that contact. Today, you can have super-targeted cart abandonment templates based on the product/s that have been left behind. For example, you could include relevant content that adapts depending on the category of item abandoned, or even change the colour scheme of the template to match the product in the basket. 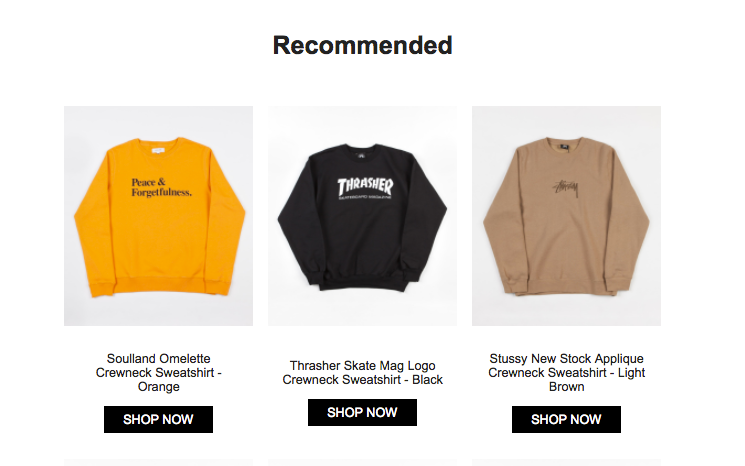 One specific type of dynamic content that you can incorporate into your abandonment emails to make them more relevant is product recommendations. After all, maybe the recipient added something to their cart but changed their mind about buying it, but could be won round by something similar. By now, the majority of us have become accustomed to basic first name and/or last name personalisation in the subject line of an email (triggered or broadcast). However, there are other ways you can personalise your cart abandonment subject line, such as name dropping the brand (if you’re a marketplace) or product looked at, or incorporating a recipient's lifecycle stage (e.g. "Hey newbie, you left this lipstick behind!". Which is brings us to cross-channel. In 2017 a cross-channel approach to any ecommerce marketing campaign isn’t just recommended, it’s seen as pretty standard practice (unless, of course, a brand has specific reasons for wishing to isolate certain channels). To reach those not engaging on email: If a contact isn’t interacting with your cart abandonment emails, adding them to a retargeting list on Facebook, Instagram or AdWords might do the job instead. This could be via product imagery (offered by Facebook Advertising) or lifestyle imagery (provided by platforms such as Ometria). To offer a more seamless customer experience: Even if contacts are engaging with your cart abandonment emails, by adding different channels into the mix you’re making sure you don’t overwhelm them with emails and instead reaching out to them on the touch points most relevant to them. Segmentation or no segmentation, cross-channel or no cross-channel, A/B testing a good way to continually optimise your cart abandonment campaigns and figure out what works. For a more detailed analysis, check out our latest ebook: 15 A/B testing ideas for ecommerce email marketers. Click here to download. Bespoke: the content, message, timing and frequency will be tailored to each consumer. Cross-channel: the campaign will use the touch points most relevant to that consumer to guarantee maximum engagement. Optimised: A/B testing will keep increasing the impact and value of each campaign to ensure it’s constantly improving.